This wonderful perennial can stand up to 6 feet tall! The flowers, which get their name because of their resemblance to the red hats worn by Cardinals in the church, range in color from scarlet, to dark red or vermilion. 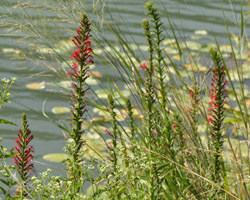 They are born on the large terminal spike of the plant, and they bloom as the spike grows upwards. 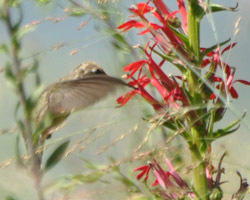 Cardinal Flowers can be multiplied easily by bending over a stem and putting a rock on it. 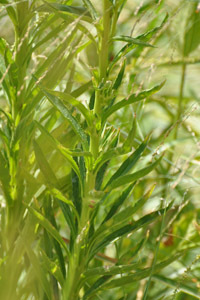 With time, a new plant will form where the stem contacts the soil. 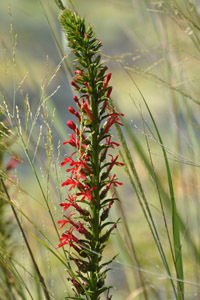 A favorite of hummingbirds, Cardinal Flowers are generally found in rich soils in semi-shaded, moist areas. Use this plant with confidence in a flower border, shaded from the hot afternoon sun, or in a water garden.